1670: born in Ôsaka. He became a disciple of Miyazaki Denkichi at a very young age. His first stage name was Miyazaki Dengorô. 1680: Dengorô settled in Edo with his master Miyazaki Denkichi. 11th lunar month of 1700: he became katakiyaku, took the name of Hayakawa Dengorô and played at the Yamamuraza the role of Taira no Tokimori in the kaomise drama "Yorimasa Mannen Goyomi". 11th lunar month of 1706: premiere in the same theater of the drama "Taihei Shusse Kagekiyo", which was considered as an earlier version of the Kabuki Jûhachiban drama "Kagekiyo"; Dengorô played the role of Kajiwara Heizô Kagetoki [casting]. 3rd lunar month of 1709: Dengorô's rank in the Edo hyôbanki, jitsuaku section, was jô-jô (superior - superior). 11th lunar month of 1709: Dengorô played at the Ichimuraza the role of Takakura-no-Miya in the kaomise drama "Genpuku Nue Yorimasa". 3rd lunar month of 1710: Dengorô's rank in the Edo hyôbanki, jitsuaku section, was jô-jô-(shiro)kichi (superior - superior - (white) excellent). 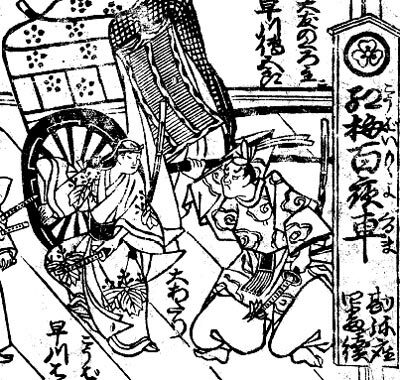 11th lunar month of 1710: Dengorô played at the Moritaza the role of Kiyomori in the kaomise drama "Onna Tsuwamono Tokiwa no Matsu"; his stage partners were Shinomiya Genpachi, Takahashi Motojirô, Tsutsui Kichijûrô I, Hisamatsu Tasanta, Saigoku Hyôsuke, Yasuda Kichirôji, Narukawa Genzaemon, Ichikawa Danzô I, Saruwaka Sanzaemon II, Matsumoto Shirosaburô and Fujioka Daikichi. 3rd lunar month of 1711: Dengorô's rank in the Edo hyôbanki, jitsuaku section, was jô-jô-kichi (superior - superior - excellent). He shared the same rank with Yamanaka Heikurô I. 11th lunar month of 1713: Dengorô played at the Yamamuraza the role of Yamashina in the kaomise drama "Sazare Ishi Nasu no Futahashira". 11th lunar month of 1714: Dengorô played at the Ichimuraza the role of Kageyu Saemon in the kaomise program "Enman Taiheiki", which welcomed in Edo the actor Wakabayashi Shirogorô; his main stage partners were Ichikawa Danzô I, Ichimura Takenojô IV, Matsumoto Koshirô, Asao Jûjirô, Yamashita Karumo and Mimasuya Sukejûrô I. 11th lunar month of 1715: Dengorô played at the Nakamuraza the role of Yorimasa in the kaomise drama "Kogane no Kaburi Konrei Yorimasa". 11th lunar month of 1716: Dengorô became tachiyaku and played at the Moritaza the role of Chihara Sakon in the kaomise drama "Yomeiri Miyako no Tsunagi Uma". 1st lunar month of 1717: Dengorô's rank in the Edo hyôbanki, tachiyaku section, was jô-jô-kichi (superior - superior - excellent). He shared the same rank with Ichikawa Danjûrô II, Matsumoto Kôshirô I, Tomizawa Hanzaburô I and Murayama Heiemon III. 5th lunar month of 1717: Chikamatsu Monzaemon's masterpiece "Kokusen'ya Gassen" was produced simultaneously in the 3 Edo Kabuki theaters. This was the first Kabuki adaptation of a puppet theater play in Edo. It was produced at the Moritaza under the title "Kokusen'ya Gojitsu Gassen"; Dengorô played the role of Gosankei [more details]. 11th lunar month of 1717: Dengorô became jitsuaku and played at the Moritaza the role of Kageyu Saemon in the kaomise drama "Hônô Taiheiki"; his stage partners were Ichikawa Danjûrô II, Ôtani Hiroemon I, Ogawa Zengorô I, Asao Jûjirô and Ichikawa Monnosuke I. 11th lunar month of 1718: Dengorô played at the Nakamuraza the role of Matano in the kaomise program "Hirakana Yomeiri Izu Nikki", which welcomed in Edo the Kamigata actor Sanogawa Mangiku. 1st lunar month of 1719: Dengorô played at the Nakamuraza the roles of Kudô Saemon Suketsune and Kamei Rokurô Saemon in the sogamono "Kaibyaku Sakayaki Soga", commonly called "Ninin Kudô" ("The Two Kudô"). The other Kudô was played by Yamanaka Heikurô I. 20th day of the 11th lunar month of 1719 : Dengorô died in Edo. Hayakawa Dengorô was a talented and popular actor, who was born in Kamigata and achieved fame for himself in Edo during the 1700s and the 1710s. He was endowed with an amazing voice and was specialized in villain roles but also made a successful season as a tachiyaku in 1717, excelling in jitsugoto or yatsushigoto. As a jitsuaku actor, he was said to be on par with Yamanaka Heikurô I, the king of jitsuaku actors. The 20th day of the 11th lunar month of the 4th year of the Kyôhô era was the 30th of December 1719 in the western calendar.